President Barack Obama insisted that flared tensions between the US and Afghan governments were "overstated" as Afghan leader Hamid Karzai staged an effusive show of support for US war goals. The leaders met amid pomp at the White House after awkward public exchanges which strained their alliance and complicated Obama's gamble on a 30,000 strong troop surge designed to forge a US exit from the Afghan battlefield. "There are going to be tensions in such a complicated, difficult environment and in a situation in which, on the ground, both Afghans and Americans are making enormous sacrifices," Obama said. "With respect to perceived tensions between the US government and the Afghan government ... a lot of them were simply overstated." Afghan President Hamid Karzai (L) shakes hands with US President Barack Obama during a press conference in the East Room of the White House in Washington, DC. The leaders met in the Oval Office then held a press conference, which was both a public bonding session and an effort by Obama to convince wary Americans that the grinding progress of a war now in its ninth year was genuine. Karzai put on an assured political performance, at odds with his tirades just weeks ago against foreign interference. His latest White House appearance came nearly nine years after the September 11 attacks, which prompted the United States to launch war in Afghanistan and Pakistan border areas against the Taliban and Al-Qaeda. Karzai also shrugged off recent spats. "We are in a campaign against terrorism together, there are days that we are happy. There are days that we are not happy," said Karzai, wearing his trademark green cloak and sheepskin hat in the ornate East Room of the White House. Only weeks ago, top Obama aides said Karzai's claims that foreigners plotted fraud in Afghan elections were cause for "genuine" concern, and said before the president was in Kabul in March that Karzai must do more to fight corruption. But on Wednesday Obama smoothed over that row, noting "progress" by Karzai on anti-corruption efforts, improved governance, and work towards credible parliamentary elections later this year. "Of course, President Karzai and I both acknowledge that much more work needs to be done," Obama said. 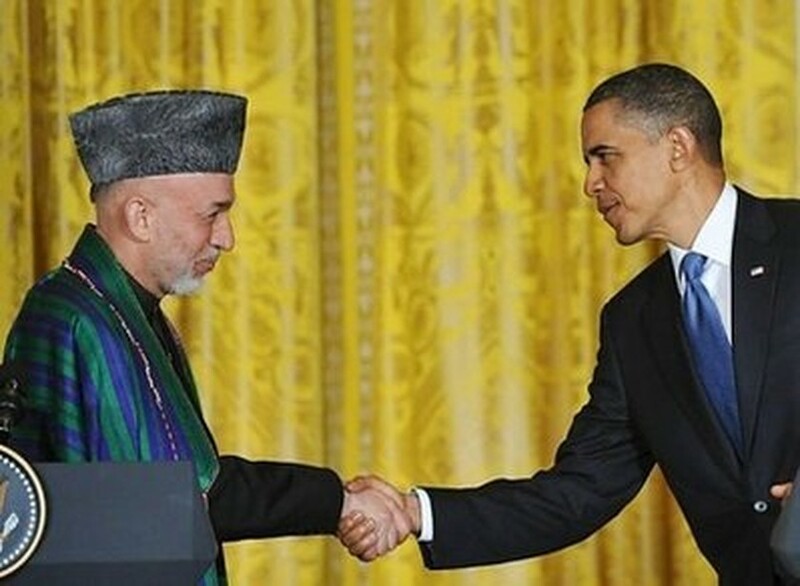 Karzai pointedly promised to husband billions of dollars of US aid. "I can reassure you that we will work with dedication and extreme care to have those resources spent well and in place for a better future for the Afghan people," he said. Obama said he was confident that slow but steady progress would allow him to meet his goal of beginning to draw down US troop numbers by July 2011, and was also "encouraged" by Pakistan's actions against extremists. In one extraordinary moment, Karzai and Obama stood face to face, a few feet apart, as the Afghan leader described his encounter with a wounded US warrior at a military hospital on Tuesday. 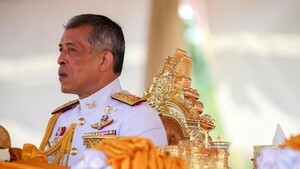 "It was a very difficult moment for me, Mr. President ... a very, very young man, who had lost two arms and legs. It was heart-rending." In another overt show of respect for US "sacrifices," Karzai was Thursday due to visit Arlington Cemetery where many US Afghan war dead are buried. Obama also provided an emotionally charged moment, offering Karzai, who has complained repeatedly at Afghan civilian casualties, a glimpse of the burden of being commander-in-chief. "Let me be very clear about what I told President Karzai. When there is a civilian casualty, that is not just a political problem for me. "I am ultimately accountable ... that is something that I have to carry with me.... I don't want civilians killed," he said. Karzai later made the rounds on Capitol Hill and pleaded for patience in his much criticized fight against corruption. Most senators gave him positive reviews in talks with reporters. "We didn't notice any scars," said Senate Armed Services Committee chairman Carl Levin, a Democrat. "Sounds like things are on a very even keel, very positive, we didn't see any evidence of any lingering problem," he said. The Afghan leader said his effort was "something that we keep doing every day, but you don't see the results here in America, or the rest of the world, on a daily basis." Obama also voiced support for Karzai's efforts to woo wavering Taliban members back into Afghan society, but only if they renounced Al-Qaeda and violence. A US military official, speaking on condition of anonymity, said Karzai wanted to negotiate a security agreement that would ensure a US commitment to Kabul beyond July 2011, when the US military drawdown is scheduled to begin.